Jewish history in Brazil dates back to the time of the voyages of Christopher Columbus. Gaspar da Gama, a Jew by birth, but later kidnaped and forcibly baptized, accompanied Portuguese admiral Pedro Alvares Cabral when he landed in what is now Brazil in 1500, beginning a more than 500-year presence in the New World. When the Inquisition in Portugal took hold in 1497, Jews fled to places throughout the world, including Brazil. They arrived in Brazil primarily as New Christians or Conversos (Jews converted to Christianity), but many secretly practiced Judaism and began a colonization drive to settle on the land. Despite continued persecution by the Brazilian Inquisition, the New Christians successfully established sugar plantations and mills. By 1624, approximately 50,000 Europeans lived in Brazil, with New Christians making up a significant percentage. They were businessmen, importers, exporters, teachers, writers poets, even priests. In that same year, Dutch forces arrived in Brazil, taking over portions of northeast Brazil. Dutch tolerance allowed for Jewish migration and the open practice of religion. In 1636, Jews built the Kahal Zur synagogue in the Dutch capital of Recife. In Dutch Brazil, Jews flourished in the sugar industry, tax farming and slave trade. Jews often purchased slaves and resold them at great profit. Those they kept often preferred to work for Jews because both Shabbat and Sunday were rest days, whereas the Portugese only gave them Sunday off, and the Dutch worked their slaves seven days a week. In 1642, Rabbi Isaac Aboab da Fonseca, a well-known Amsterdam rabbi and scholar Moses Raphael d’Aguilar came to Brazil as spiritual leaders to assist the congregations of Kahal Zur in Recife and Magen Abraham in Mauricia. By 1645, the Dutch Jewish population peaked at 1,500, approximately half of the European population there. Synagogue records show a well-organized Jewish community with high participation, including a Talmud Torah (school), a Tzedakah fund and an overseeing executive committee. Other Inquisition-fleeing Jews headed south to São Paulo. Little is known what happened to them, some scholars suggest they assimilated quickly, however, recent evidence has revealed Brazilian jungle tribes who light candles on Friday night and refrain from eating pork. In 1647, the Portuguese authorities arrested Isaac de Castro for teaching Jewish rites and customs in Portuguese controlled Brazil and sent him back to Portugal where the Inquisition sentenced him to death and burned him at the stake. The Portuguese also started a nine-year war that successfully drove the Dutch out of Brazil in 1654. Portuguese anti-Jewish persecution led to a mass immigration to places like Curacao and New York, where they laid foundations for new Jewish communities, others returned to Europe. Most who could not escape were killed, but some became Crypto Jews, practicing Judaism in secret. They lived away from the authorities, in the interior of Brazil, many becoming ranch hands or cowboys. The persecutions, arrests, confiscation of property and emigration of the Jews greatly damaged the Brazilian economy by bringing the manufacture and export of sugar to a near standstill and seriously disrupting trade between Portugal and Brazil. In 1655, the Portuguese closed a major symbol of Brazilian Jewry, the Kahal Zur synagogue. However, thanks to the Safra banking family, the synagogue re-opened in 2002 and now stands as the oldest existing synagogue in the Americas, housing a Jewish cultural center and hosting some religious ceremonies. In 1773, a Portuguese royal decree finally abolished discrimination against Jews. They slowly filtered back into Brazil. Almost 50 years later, in 1822, Brazil gained independence from Portugal, and a stream of Moroccan Jews began arriving, and set up a synagogue in Belem (northern Brazil) called Porta do Ceu (Gate of Heaven) in 1824 and later one in Manaus (on the Amazon river). By World War I, Belem’s Sephardi community of 800 people had its own charitable organizations and a social club. In the last decade of the 19th century, European Jews began discussing the idea of establishing agricultural settlements in Brazil as an alternative to the unfavorable conditions in Europe. After the 1891 expulsion of the Jews from Moscow, a close associate of Theodor Herzl, Oswald Boxer went to Brazil and returned with a positive report, but plans were abandoned because of Brazilian political strife. The first agricultural settlement was finally established in 1902 by the Jewish Colonization Association (JCA) in the Santa Maria area (southern Brazil). Despite a 1903 pogrom in Bessarabia, only 37 Bessarabian families were willing to settle in the experimental colony, which covered 13,388 acres. The 1904 farming season failed because of inexperience, insufficient funds and poor planning. Although a cooperative headed by an experienced teacher formed in 1907, the settlement continued to produce a fraction of its capability. In 1926, the JCA reported that of the 122 families that settled in the first colony, 17 remained, cultivating corn and beans on only 326 acres. The unused land was then sold. In 1909, the JCA bought another track of land covering almost 94,000 acres in the Quatro Irmaos area, north of Santa Maria and near a large-scale government development. Despite a more rigorous selection process, the settlers once again failed. Administrative problems, lack of agricultural facilities and the lure of city jobs doomed the settlement. By November 1915, only 72 of the original 232 families remained in the colony. World War I and a civil war, which was partially fought on the colony’s land drove out more settlers and by 1926, only 40 people remained. In 1920, the JCA began selling some of the land to non-Jewish settlers. In 1935, after a renewed settlement effort, 104 Jewish families lived in Quaro Irmaos, only to be outnumbered five to one by non-Jewish settlers. The JCA led a third attempt at agricultural settlement in 1935 because of deteriorating conditions in Germany. However, as part of a strict immigration policy against Jews, the Brazilian government refused to issue the settlers entry visas. The land was later sold. The settlers who abandoned the colonies set up rich cultural communities in Brazilian cities. By World War I, approximately 7,000 Jews lived in Brazil. In Porto Alegre, capital of the southern state of Rio Grande do Sol, the community opened a Jewish school in 1910 and established a Yiddish newspaper, Di Menshhayt (“Humanity”) in 1915. Sao Paolo was home to several philanthropic and cultural associations. In 1916, the Jewish community of Rio de Janeiro formed an aid committee for World War I victims. Almost 30,000 Western European Jews came to Brazil in the 1920s and, by 1929, there were 27 Jewish schools. Despite a strict immigration policy in the 1930s, more than 17,500 Jews entered Brazil. While immigration enriched Brazilian Jewish culture, the wide array of Jewish customs and beliefs, made it nearly impossible to unify them, despite attempts by Rabbi Isaiah Raffalovitch of JCA. Brazil began an assimilation effort in 1938 and closed the Yiddish newspapers and the Jewish organizations, both secular and religious. A wave of anti-Semitism followed, including several editions of the Protocols of the Elders of Zion. Only after Brazil adopted a new, more democratic constitution in 1945, did organized Jewish activities resume. In 1947, Brazil voted for the partition of Palestine and for the creation of a Jewish state at the United Nations General Assembly. A Brazilian statesman, Oswaldo Aranha, played a vital role in the adoption of the resolution. Brazil recognized Israel in February 1949 and opened an embassy there three years later. In 1959, Brazil and Israel signed the first of several agreements to cooperate in a variety of areas, including culture, commerce, agriculture, science and industry. In the late 1950s, another wave of Jewish immigration brought more than 3,500 North African Jews to Brazil. By the 1960s, Brazilian Jewry was thriving. In the 1966 parliamentary elections six Jews, representing various parties, were elected to the federal legislature. In addition, Jews served in state legislatures and municipal councils. In 1967, 33 Jewish schools were attended by more than 10,000 students. By 1969, approximately 140,000 Jews lived in Brazil, mostly in the large cities: Rio de Janeiro (50,000), Sao Paulo (55,000), Porto Alegre (12,000), Belo Horizonte (3,000), Recife (1,600) and Belem (1,200). Jewish communal life was uneventful throughout the 1970s, save some minor anti-Semitic activity by the right-wing Catholic organization Tradicao, Familia e Propriedade (Tradition, Family and Property). Today, Brazil’s rich cultural life includes several Jewish publications as well as a weekly Jewish television program, Mosaico. Author Moacyr Scliar has been published worldwide. Museums exhibit Jewish history and art and efforts to preserve Brazil’s Jewish history are underway. The Center for Jewish Studies of the University of Sao Paulo, the Federal and State Universities in Rio de Janeiro and the Marc Chagall Institute in Porto Alegre sponsor lectures, conferences and academic courses of Jewish interest. Jewish and Israeli film festivals are common in Sao Paulo and Rio de Janeiro. Special commemorative and cultural events are held in conjunction with Yom HaShoah and Yom Ha’atzmaut. Within Brazil’s Jewish community are several Zionist organizations, youth groups, adult groups, and social clubs, including B’nai B’rith, Hadassah International, Pioneer Women, the World Zionist Organization and the Jewish Agency for Israel. Like many other countries, Brazil’s religious observance encompass a wide spectrum, from liberal to orthodox with both strong Sephardi and Ashkenazi influences. Chabad-Lubavitch has grown considerably in recent years with schools and synagogues in several major cities. Politically, Jews have continued to play an important role. In 1994, Jaime Lerner was elected head of Parana, a major industrial state, becoming Brazil’s first Jewish governor. In 1998, Dr. Eva Alterman Bay, a distinguished professor, became the first Jewish woman to serve in Brazil’s Senate. Jews have also served in the Cabinet. Professionally, Jews have made a tremendous impact on the Brazilian economy. Jewish families own Brazil’s two largest publishing and jewelry companies, the sixth largest bank and are among the executives of several other large corporations. While Brazil’s total population exceeds 160 million people, the Jewish population has stabilized at approximately 120,000. More than 8,000 Brazilian Jews have moved to Israel since 1948. There are more than 40 active synagogues, several kosher supermarkets and a number of kosher restaurants. The Confederacao Israelita do Brasil (CONIB), founded in 1951, is the central body representing the 12 federations (states) of Brazil, and serves as an umbrella organization for more than 200 associations involved in Zionist activity, Jewish education, culture and charity. Brazil’s Jewish community has been on high alert since the 1994 bombing of the Jewish community headquarters in nearby Buenos Aires, Argentina, but has suffered only isolated anti-Semitic attacks such as harassment, threats and vandalism. Intermarriage is actually the greatest threat to Brazilian Jewry. Experts say the rate is even higher than in the United States. Brazil’s slumping economy poses another challenge for the Jewish community. Sao Paulo is home to 75,000 Jews, approximately half of Brazil’s Jewish population. 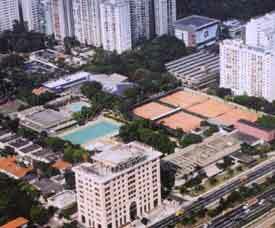 Located on Rua Antonio Carlos 653 is the Congragacio Israelita Paulista. This Ashkenazi synagogue is the largest on the continent with 2,000 family members (600-700 regularly attend Friday night services). The primary Sephardic synagogues are Ohel Yaakov and Beit Yaakov. At Rua Hungria 1000 is the 28,000-member Jewish club called Hebracia. It resembles a self-contained city, complete with swimming pools, movie theaters, ballroom, synagogue, bank, restaurants, art gallery, library and more. A tiny Hasidic synagogue still functions in the old Jewish neighborhood called Bom Retiro (“Good Retreat”) is in northern Sao Paulo, but most of the Jews have moved to other parts of the city. There are four orthodox schools and four secular Jewish schools. Approximately 3,000 students attend the Educacio Hebraico Brasileiro Renscenca at Rua Prates 790. Sao Paulo Jews are especially proud of their support of the Hospital Israelita Albert Einstein, one of the best in all South America. The Casa da Cultura Judaica, the Jewish cultural house is another popular place that organizes debates, folk dancing and other activities. 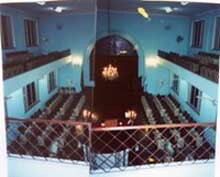 In 2001, the synagogue in Recife, the first shul ever built in the Americas, was reopened, 347 years after it was closed by Portuguese colonial rule. After two years of excavation and restoration, the synagogue will house a Jewish cultural center and host a few religious ceremonies. The synagogue had not been used since the mid-17th century when the Portuguese defeated the Dutch at Recife and expelled the estimated 1,200 Jews and banned Judaism. The Jewish museum in Rio de Janiero documents the history of Jews in Brazil and gives insight into the culture of the city’s Jewish community. The area around Rua Alfandega is the center of Rio’s old Jewish neighborhood. The Congregation of Grande Templo Israelita is located at Rue Tenente Possolo 8. Vandals attacked the Brazilian Israelite Society of Pelotas Synagogue on May 20, 2018. A flammable substance was poured over the synagogue’s main entrance and set ablaze, causing damage. The vandals also scrawled pro-Palestinian and anti-Semitic messages on the walls of the synagogue. In August 2004, the mayor of Sao Paulo declared her city a sister city with Tel Aviv. Mayor Marta Suplicy said the new status would strengthen ties between both Brazilians and Israelis. Suplicy, who had recently married a Jew, added that the new status would be a kickoff for urban, cultural, scientific, tourist and economic programs. The Brazilian subsidiary of Israel’s Elbit Systems Ltd, Ares Aeroespacial e Defesa S.A., signed a $100 million agreement to supply the Brazilian military with remote-controlled weapons stations in January 2017. The system, including 12.7/7.62 mm Remote Controlled Weapon Stations (“RCWS”), nicknamed “REMAX” will be delivered over a 5-year period. The number of Brazilian Jews making Aliyah to Israel more than doubled between 2011 and 2015. In 2015, 463 individuals immigrated to Israel from Brazil, compared with only 191 in 2011. This number represents a 41% increase from 2014’s 308 immigrants. Retival Poleg, head of the Jewish Agency’s delegation to Brazil, stated in November 2016 that, “the Jewish community is very Zionist and very connected to Israel, and their decision to make aliya is a combination of different factors, including the economic situation, issues of personal safety, educational opportunities in Israel, and... the possibility of living among your own people.” Brazilian Jewish immigration to Israel only accelerated in 2016, with more than 700 individuals making Aliyah. Three months later, however, he backed away from the pledge out of fear of alienating Arab countries who, among other things, were large purchasers of Brazilian halal food. Instead, during a reciprocal visit to Israel, Bolsonaro announced the opening of an office in Jerusalem “to promote trade, investment, technology and innovation as a part of its embassy in Israel” while keeping its diplomatic mission in Tel Aviv. Upon his arrival, Bolsonaro said in Hebrew: “I love Israel.” He later visited the Western Wall with Netanyahu. Sources: Original article by Alden Oreck. “Brazil Opens Israel Trade Mission in Jerusalem, Short of Full Embassy Move,” Reuters, (March 31, 2019).